Last Saturday 16th of September, Abbey Road Institute once again opened its doors to Melbourne’s most enthusiastic, aspiring producers to experience life as an Abbey Road student at our Study for a Day event. The day was jammed packed with information and structured around hands-on, one-on-one mentoring work-shop styled sessions. The day started out with our head trainer, Lance Krive, giving a brief history of sound recording, outlining the influence Abbey Road Studios in London had on the development of sound recording. He also detailed the many artists through the decades that have utilised the studios at Abbey Road, and the specialised recording techniques that were developed within its hallowed halls. The inspired group was then ready to kick off their first practical workshop. 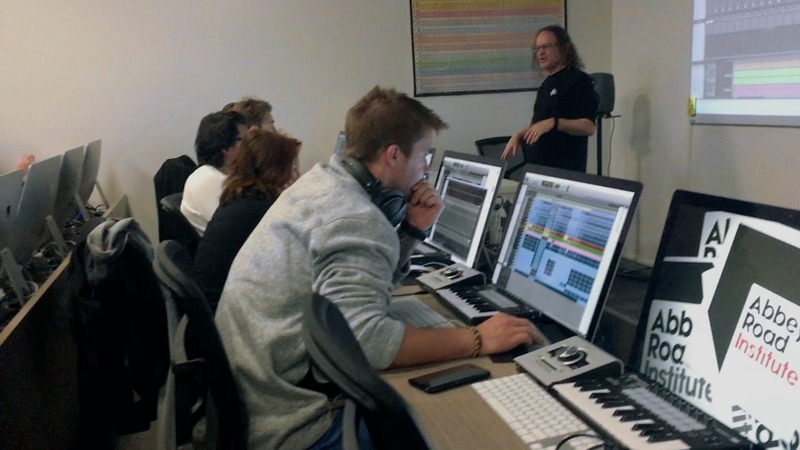 After an introduction to the industry standard software for recording and mixing, Pro Tools, students commenced a mixing assignment on their own computer workstation in our custom designed labs. After an hour working on the track as Lance guided them through the process of mixing, it was time for a well earned lunch break. After everyone had refueled it was straight back into the hands-on learning! The remaining part of the day saw three mini-tutorials running simultaneously with students being able to choose the area they would most like to learn. Bradley Toan, ARI’s Senior Technical Officer, was detailing mixing on the fully digital Avid S6 control surface, while producer and industry business and legal specialist, Julian Davis guided students through analog signal flow and mixing in the API 1608 studio. Attendees were able to move freely between the areas, asking questions and picking up tips as they went. The feedback from everyone was fantastic, with those looking for full-time or part-time study options in our upcoming October 16th seeing first hand what it is like as a student of Abbey Road Institute. If you, or anyone you know, would love to attend an event like this, make sure you send an email to melbourne@abbeyroadinstitute.com to express your interest for our next event. We offer one-on-one VIP tours of the campus at a time that suits you, so call 1800 274 338 to arrange a tour or speak to one of our staff about study and career opportunities.